connect in a meaningful way, encourage and watch out for each other is the highlight. it is pure magic . . ."
It was 9 AM Wednesday, December 31. After training for and obsessing about Across the Years for the past six months, it was finally my turn to run and walk the next 24 hours. I'd been chomping at the bit since Monday, when the first large group of runners began their races, then again on Tuesday when another smaller group started running. It was fun to watch their progress and to see the changes on the leader board as runners moved up or down in the standings in each of the three races. But I wanted to be out there, too. Those of us running on Day 3 would continue to shake up the standings. Juli eloquently described in the quote above the experience I had at ATY when I ran it last year for the first time. I knew even before I walked off the track that I'd be back again this year if I made it through the selection process again. This event is pure magic and we love being a part of it. Like most runners who compete against the course and the clock and each other at ATY, I wanted to improve on the distance I ran last year. I wanted to spend less time off the track for cramping and blister problems. 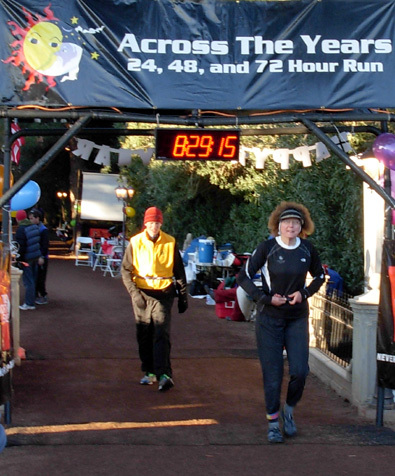 And I wanted to "beat" the previous F59 single-age ATY distance record of 70+ miles in the 24-hour race. My training focused on those goals since last spring. I ran more tempo runs and repeats to increase my speed. I signed up for a 50K with a tight time limit so I'd push myself harder. I practiced various run-walk patterns and longer periods of sustained, easy running so I could vary my stride, pace, and technique as the race wore on. I worked diligently on increasing my walking pace. I practiced drinking more and taking a higher dose of electrolytes in training and the three races I ran in the fall so I could hopefully prevent dehydration and cramping. I got rid of most of the calluses on my feet and tried different methods of blister control so I'd be less prone to debilitating blisters during the race. And I simply kept my mental focus on ATY as my Big Goal Race. The New River Trail 50K, Hinson Lake 24-Hour Run, and Sunmart 50K were "just training runs" to build up my endurance for ATY. I was very happy last year to reach 75 miles at Across the Years. That was my goal and I was very happy to reach it, although I was disappointed that I lost about three hours off-track dealing with problems that could have been prevented. It made me wonder how much farther I could have gone if I'd done everything right. When I registered for this year's race in July I decided 90 miles would be a realistic goal if my training continued to go well. But after hurting one of my hamstrings in mid-October, I stopped doing speed work so the hamstring could heal. I concentrated more on walking long and hard so I could return to training faster. I reset my goal for a minimum of 75 miles again. That would still give me a new F59 ATY record for 24 hours. Anything over that would be a sweet bonus. Kari Mastrocola and me after two laps. I also added another goal for ATY: not to re-injure my hamstring during the race. I'd gotten up to only the 50K distance since hurting it. Would it hold up for 75 miles?? 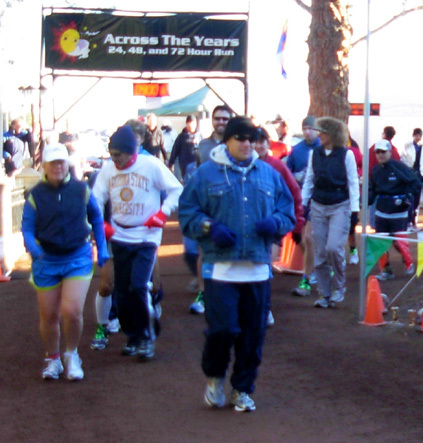 Until I stepped onto the track on Day 3 and got "happy feet," I considered walking the entire race. Last year I lost a total of about three hours off the course because of cramping and blisters. If I could avoid those problems this year by just walking as fast and as steadily as I could, perhaps I'd get even more miles than last year simply because I was on the track every possible minute. I mentioned in the last two entries that Jim and I had very different strategies for pacing, nutrition, use of the camper, etc. during the race, not just because he was going to be on the course twice as long as me but also because of our different experiences and personalities. He's generally more Type A and I've been trying to become more Type B the last ten years. One of the biggest differences was our approach to the race and how we planned to pace ourselves. Jim studied the splits of some of the 2007 ATY 48-hour runners who finished in the range of miles he thought was realistic for him. He printed out a pace chart with his best-case scenario times and distances to shoot for. (He didn't include his moderate, more realistic splits this time, which was unusual for him.) He consulted the split chart during the race to compare how he was doing and recorded his mileage every hour. He also stuck to a more structured run-walk pattern around the course on the first day, usually running/walking the same stretches each time. In some previous hundred-milers I made similar split charts but I didn't put nearly as much thought into them as Jim did. As I slowed down the past decade, I just printed the cut-off times I needed to beat at various aid stations and the finish. Then I decided even that was too O-C for me! I could memorize cut-off times. Following a split chart killed the fun of just going out there and doing the best I could under that race's particular circumstances. Knowing I was falling behind on a split chart would have made races even more stressful than they already were as I morphed from a mid-packer to a back-of-packer. Occasionally that pressure spurred me to run faster and avoid getting cut off; more often I was already in my fastest gear and no amount of internal or external pressure could make me go any faster. pass me on the backstretch on Day 3 as I stop to take their picture. 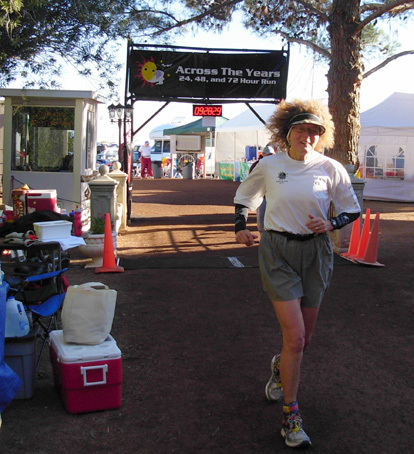 For ATY last year the most I did ahead of time was determine that I wanted to run about 45 miles the first twelve hours and walk 30 miles the second twelve hours. I knew about how many miles per hour that was, and just watched the lap screens carefully enough to determine if I was keeping up. If I fell behind, I'd run a little more on each lap. My informal Type B "strategy" worked very well last year (despite three hours off the track), so why not go with the flow again this year?? I did just that. I ran and walked as I felt. I knew I wanted to get about 45 miles in the first twelve hours again. I had no idea if my hamstring would hold out all day and night if I did any running, so I was very careful once I did begin running to "listen" closely to my body for any problems. I could live with falling short of my distance goal if I was overly-cautious and my hamstring and knees held out, but if either of those body parts failed because I pushed too hard and had to quit far short of my goal, I would have been very disappointed. I lined up with nineteen other men and women in the third wave of 24-hour runners on Wednesday morning and waited for the clock to tick down to exactly 9 o'clock. Jim had finished his 48-hour run a few minutes earlier and was taking pictures. Third day 24-hour runners get started. I'm on the right in the black vest and tan pants. I was calmly excited, if that's possible. 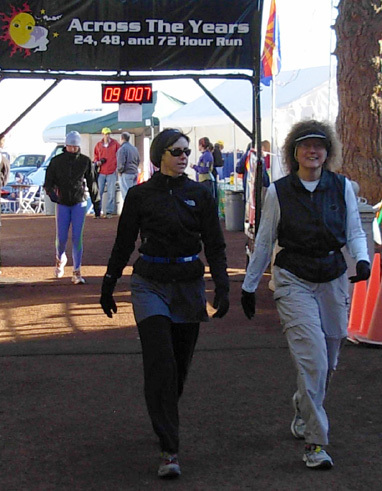 Twenty-four hours is a long time and I knew I needed to walk as long as it took my muscles to warm up before deciding whether I'd run any of the race. Others like eventual 24-hour winner Wendell Doman started off running from the get-go. I walked the first three laps at a 16+ minute-per-mile pace (4:58 to 5:04 minutes per lap), then just couldn't stand it -- I had to try some running. 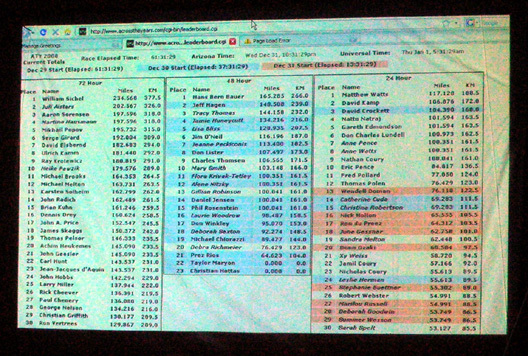 My fourth lap was a brisk 3:42, the fastest lap time I had during the race. I had several of those in the next four hours. Yes, four hours. I couldn't help myself. As the temperatures warmed up during the day, so did I. Jim took this photo of me 28 minutes into the race and I had already taken off my vest and pants (not sure how I did it so fast, though -- check my splits the first five laps). My Moeben sleeves and long-sleeved shirt came off not long after that; I ran the rest of the day in my singlet and shorts until I had to start putting layers back on after supper. I'm surprised Jim hung out at our aid table as long as he did. About 9:30 AM he went back to the camper to clean up and take a nice, long nap. I was on my own for several hours and loving every minute of the race. He came back out a few times in the afternoon and evening to watch everyone's progress and take more photos. 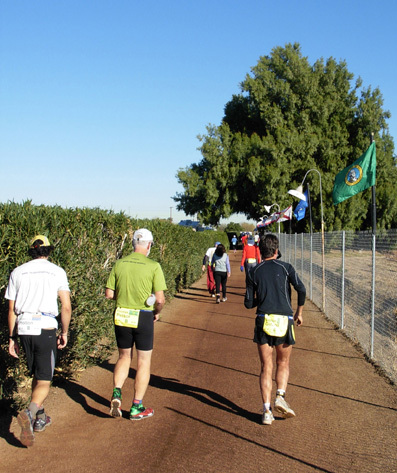 I felt great the first four hours of the race as I spontaneously alternated running and walking. I don't think I ever ran or walked in the same places around the track except to walk (and stop frequently) at our aid table close to the timing mat. But my MO worked well for me. Running felt wonderful. I had no hamstring twinges or knee pain. All those stops -- approximately twice every three laps -- at our table were to sip some Perpetuem, water, and occasionally Hammergel.. I eventually started carrying a water bottle with me on some laps to save time, but not until afternoon when I was only walking and not running. My laps the first four hours were remarkably consistent. 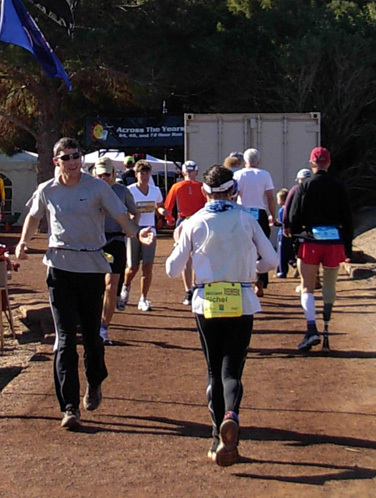 The longer ones were for fluids and gel, pit stops at the portable toilets, shedding clothes, or taking photos. I took the camera with me on three laps between 10 and 1 PM, taking a total of about two dozen pictures. 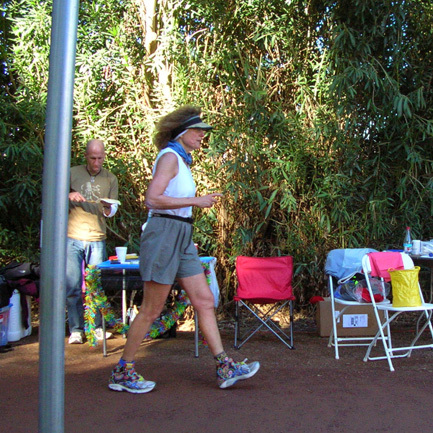 Debbie Goodwin, Stephanie Buettner, and Dennis Drey cross the timing mat in front of me. I didn't stop at the race aid station at all until later in the afternoon. I used concentrated Perpetuem and Hammergel for all my calories until suppertime. My longest lap prior to 1 PM was only 6:07 minutes. I averaged 14:25 minutes per mile the first four hours and covered over 16 miles. At the end of those four hours I was feeling a hot spot above the bunion on my right big toe. I usually get a blister under the thick skin on the bunion during ultras so I diligently ground down the tough callus prior to the race with a PedEgg and had Chris O'Loughlin tape over it when he did my pre-race foot taping Tuesday night. But now I was getting a sore spot just above that area, right where the tape stopped. One of my race goals was to NOT bother Chris during the race unless it was absolutely necessary to save my run. So I popped into the Kachina Rescue tent and asked Andy-the-EMT to add some more tape to that area (he's the guy who taped Jim's blister). Although a small blister did develop there later on, I could run and walk OK with it and it didn't affect my race. Before the race I had already determined that I'd walk during the heat of the afternoon, regardless of how well any running I might be doing was going. I knew I'd be more likely to get dehydrated and mess up my electrolyte balance if I pushed through the heat like I did last year. I figured maybe I could avoid any leg cramping by only walking. Lo and behold, it worked! I stuck to that loose "plan" the next 5� hours. My splits remained fairly consistent in the 5:06 to 5:40 minute range per lap except for potty stops, etc. I passed the marathon mark just before 4 PM and the 50K mark when they brought out the burritos. Burritos?! Yum! I couldn't resist them after eating nothing but Perpetuem and Hammergel all day (and a small piece of watermelon in the middle of the afternoon). When one of the Coury brothers offered me a spicy bean burrito as I passed the aid station around 5 PM, I accepted. ATY is renowned for its gourmet suppers. Monday's runners and volunteers got delicious Chicken Cordon Bleu (there was also a vegetarian alternative but I don't know what it was). Tuesday's runners could choose from meat or veggie lasagna. Wednesday's choices were a variety of meat or bean burritos from mild to spicy. I inadvertently got the spiciest version but it was so tasty that I asked for a second one when I saw how well the first one went (and stayed) down. I WONDER IF I CAN RUN AGAIN? I thought maybe I'd try running again when it began cooling off. The temperature drops quickly in the desert between 4 and 5 PM when the sun gets low. But now my stomach was full, so I kept walking until it was dark. I didn't have much hope that I'd be able to run again, however. It's usually too hard for me to crank back up to a higher gear after walking for so long. But check out lap #112 at 6:28 PM: a 4:05 minute 500 meters, the fastest I'd gone since about noon! Where did that come from? I surprised myself. Running part of each lap felt good, so I continued until about 9 PM. It was twelve hours into the race and I'd reached my first-half goal of 45 miles. My average pace so far was about 16 minutes per mile. Here's the interesting part. Last year I reached 45 miles about fifteen minutes earlier than I did this year, but I was off the track about an hour for cramping intervention from Chris and Andy. That meant I was going a faster pace last year -- and trashed my legs. This year I accomplished almost the same thing but didn't cramp and didn't wear myself down so much. I did more things "right" this time: more fluids, more electrolytes, more walking, less running. Hmmm . . .
for Lisa Bliss, is in the background. 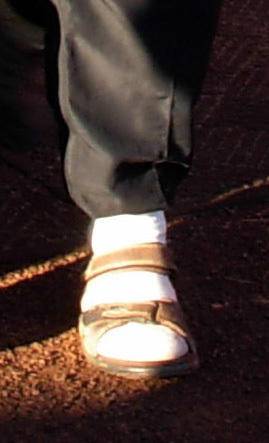 He withdrew from the 48-hour race due to an injury. At that point I probably could have continued running but I was more concerned about protecting my hamstring than pushing the pace. If I walked the rest of the race as fast as I comfortably could, and didn't lose time for any major problems, I figured I could crank out at least three miles each hour -- another 36 miles, which would exceed my goal of 75 miles. When I found myself doing a little more than three miles each hour, I was ecstatic. But I'm getting ahead of myself. Let me go back and talk about some other aspects of the race before giving away the ending! I mentioned that waiting until the third day to run was hard, but I think it's my favorite day to run the 24-hour race. There are several reasons. 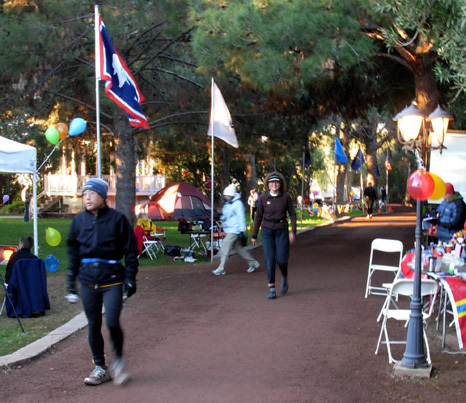 By then, almost all of the 72-hour runners are either entirely or mostly walking. Some of them are too exhausted to want to carry on conversations but most are eager for that distraction. I was able to talk to more folks this year than last, when I ran on the second day. I even got to know German runner Martina Hausmann better. Last year she pretty much ignored me; this year we had several conversations. 72-hour runners (in yellow bibs) are doing a lot of walking by Day 3. Two of my biggest surprises came during the third night. Since it was my first night, I still had a bunch of energy and was walking a relatively fast clip, at least compared to the pooped 48- and 72-hour runners who'd been out there a lot longer than me. Not only was I walking faster than some of the elite runners, imagine my surprise when two of the faster guys in those races asked if they could pace off me at different times during the night. That was definitely a first! I enjoyed their company because the track was pretty deserted and I was still wound up. Not only were they able to keep moving faster than they might have without a "pacer," my new role kept me going at a faster clip, too. It was a little frustrating until I finally reached the top 30 in the middle of the night and could watch how I was gradually "passing" runners from the first two days of the 24-hour race. Then it became great fun to pick off names on the board as the night wore on! I made my observation about "stalking" vs being stalked to Rodger when I saw him at the leader board computer and he laughed. He was very familiar with the phenomenon but it was my first time experiencing it. Great fun if you have an ounce of competitive spirit in you. Another advantage to running the third day this year was that the track surface was more packed down and had fewer soft spots on the edges than the first two days. Rodger spent an awful lot of time and money widening and relocating the track in November and December. Then four times the normal amount of rain fell in the two weeks before the race and he literally had to put on several more tons of crushed granite. He did the absolute best he could to perfect the surface before the race but some runners didn't like how "spongy" it was. That probably wouldn't have bothered me on Days 1 or 2 because it would have felt good on my aging joints. Two other advantages to running the third day are being on the course during the New Year's Eve celebration and being smack dab in the middle of all the excitement at the end of the race on Thursday morning. There are always several runners from other countries at ATY. This year participants came from 26 states and four other countries. All the "foreign" runners were in the 72-hour race. (That makes sense: you probably wouldn't travel three states away for a 5K race, but you would for a marathon.) 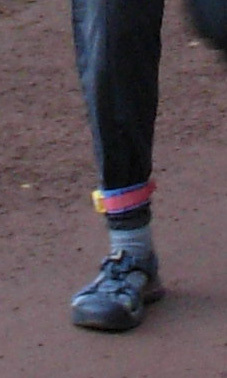 Germany led the foreign contingent with four runners (Martina Hausmann, Heike Pawzik, Dagmar Grossheim, and Achim Heukemes). William Sichel (and his paid handler) flew from Scotland, Serge Girard and his crew from France, and Paul Chenery from Canada. That was also the only time I saw Heike in a bad mood. On Day 2 she posed for photos and spoke nicely to me again when I saw her going around the track. 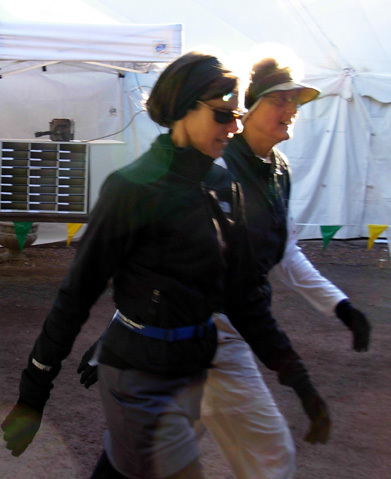 On Day 3 when I shared the track with her she was in great spirits and called me "Super Sue" every time one of us passed the other. I never saw her take the race in a deadly serious manner like Martina Hausmann, yet she placed 10th overall in the race with 200 miles. 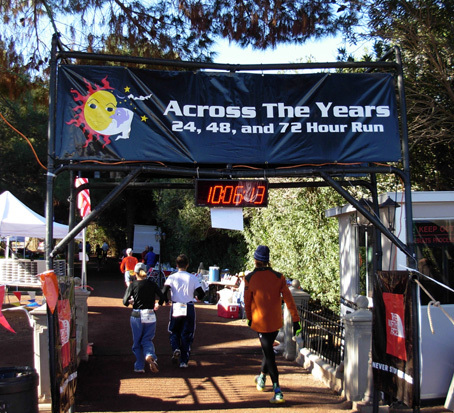 I re-learned two things from this and other experiences at ATY: the 72-hour runners go through more of a gamut of emotions than the other runners during the course of the race, and runners tend to think that volunteers have more power than they really do. William Sichel (foreground) from Scotland during the 1 PM turnaround on the track. Anyway, being as Ameri-centric as I am, I didn't even think about the New Year arriving in Europe eight hours earlier than in Arizona! At 4 PM other runners started wishing Heike and Martina a Happy New Year and it dawned on me. Heike was on a cell phone talking to someone at home. An hour later several of us wished Scot runner William Sichel a Happy New Year; he was pleased that the other runners were thinking of him. The Europeans had their own little celebrations that afternoon but happily joined in the bigger celebration that began at 11:45 PM Mountain Time. One of the reasons I wanted to run the third day this time was missing the New Year's Eve party last year. I slept through most of it. I blamed Jim for not waking me up in time (I had finished my race that morning and was sound asleep) but it was really my own fault for not setting my alarm. Jim was out helping Rodger and Paul get ready for the celebration and he didn't want to disturb me because he knew I was tired..
Well, I pretty much blew it again this year. 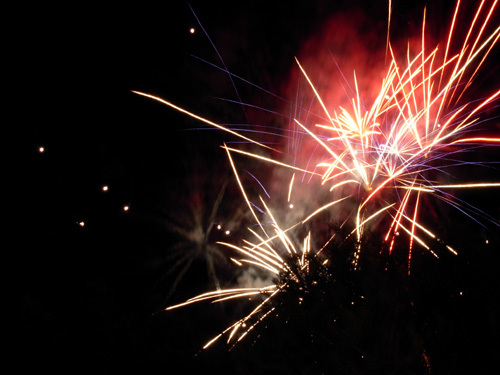 One of my goals for the 2009 race (if we get in again) is to do the New Year's Eve celebration right! Looks like the volunteers got into the bubbly, too! Jim came back out to enjoy the festivities and to celebrate the New Year with me. I wasn't sure what the drill was, so I kept on going around the track until very close to midnight. I was more focused on getting miles than stopping to party. That was a mistake I regret. Although Jim and I briefly celebrated both the New Year at midnight and our eighth wedding anniversary at 12:01 AM, I forgot about the traditional group walk around the track as the fireworks are lit. To give you an idea of how focused I was, I asked Jim to take photos of the fireworks; I didn't even want to take an extra minute or two to take pictures! 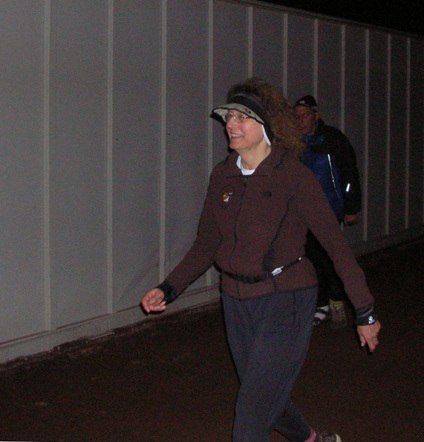 I continued walking around the track with just a few of the other runners who were as focused on miles as me. 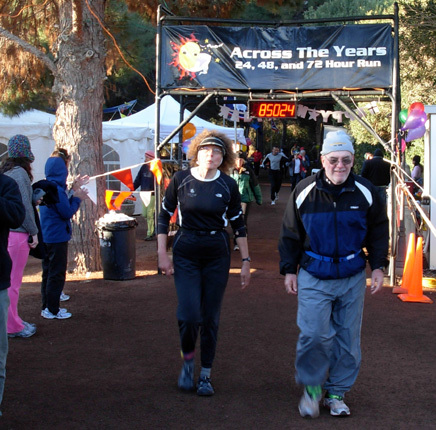 I was walking too fast for Jim to keep up after his 48-hour run. I should have waited and walked with Jim and most of the other runners slowly around the track as the fireworks went off in sync with the location of the group. 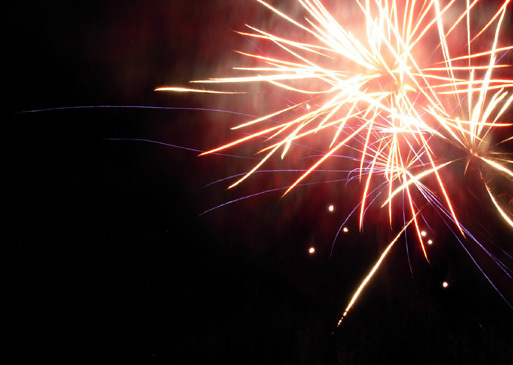 I was able to enjoy the fireworks but didn't have the camera with me -- or Jim. He was so tired he went on back to the camper and missed the grand finale. I'm so sorry I inadvertently ruined that experience for the two of us. Sometimes you can be too focused on the Big Goal and miss out on some of life's treasured moments. I'll do it right next time. Despite that screw-up, I had an amazing night on the track. I love running or walking at night on mountain trails. It's even magic for me on a well-lit track. The sky was clear, the stars bright with only a sliver of moon. 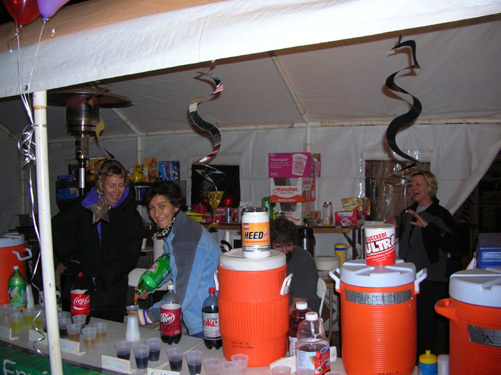 I was moving fast enough to stay warm, eating enough hot soup from the aid station and drinking enough Perpetuem to stay energized, and having fun with the more lucid runners who came and went throughout the night. Most seemed glad to have some distracting conversations to help them stay awake and moving steadily. I left the ones alone who I sensed needed quiet or who had on headphones. I said "good job" a lot to encourage the 72-hour runners, especially. I am in awe of their tenacity. I can't even imagine being out there for two days, let alone three. Twenty-four hours was just right for me. Like last year, I never once even considered going into the camper, not because Jim was asleep and I didn't want to disturb him but because I had no reason to go in. 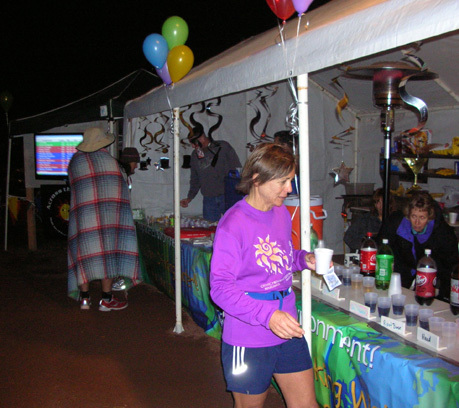 I had everything I needed at my table or at the race's aid station. Caffeine from my favorite flavors of coffee, espresso Hammergel, a couple bottles of Starbucks frapuccino, and chocolate-covered coffee beans kept me wide awake throughout the night. I didn't start to feel drowsy until the end of the awards ceremony on Thursday morning when everyone left to go home. As usual, I didn't do any caffeine withdrawal before the race because I'm pretty sensitive to the stuff and don't need much to keep me wired. I reached the 100K mark at 2:25 AM, almost 17� hours into the race. Although most of my group of 24-hour runners were on the track all night, many of the 48- and 72-hour runners were taking longer breaks to sleep. I noticed a definite increase in the number of runners back on the track starting about 5 AM. The roosters had been crowing for a while, but the sun wasn't up yet. The runners knew they had only a few hours left to get more miles. I reached my "realistic" goal of 75 miles at 6:47 AM, earlier than I reached that distance last year. I was elated because I was still feeling good and had a little more than two hours left in the race. Yes!! I calculated that I should be able to walk another seven miles if I could keep up my current pace. Eighty-two miles would be great! 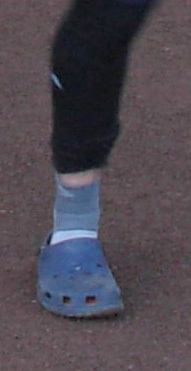 By then, however, my left heel was starting to hurt from the second blister I developed during the race. This one was under the tape on my foot. Two laps later I sat at my table and took a few minutes to remove my gaiters, two pairs of socks, and the extra-wide Asics 2130 road shoes I'd worn the entire race so I could inspect my heel. I wore the Keens over the same Injinji toe socks and Smartwool over socks I'd been wearing for 22 hours; they were fairly clean because I'd also been wearing Dirty Girl gaiters throughout the race. 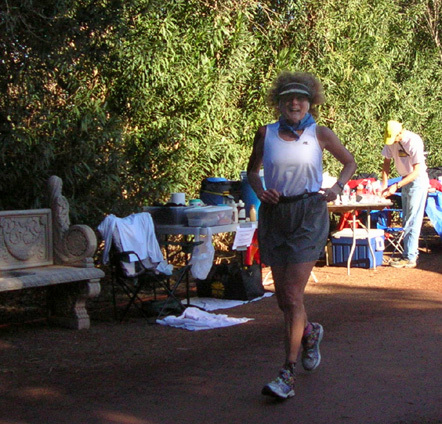 You can see the sandals in the next three photos Jim took of me during the last 90 minutes of the race. I was a bit concerned about picking up grit from the track in the sandals but I had to empty them only a couple times in the remaining two hours. The sandals were comfortable and I just kept on truckin'. By the time Jim came out about 7:30 AM on New Year's Day the sun was up and almost all of the runners scheduled to still be running were back on the track. It was amazing to watch some of the folks who'd looked like zombies a few hours earlier . . . now practically sprinting around the track! What a finish surge some of them had! Even John Geesler, who was reduced to a painful limp the last two days, was running at the end. I'll talk about some of the more interesting finishes in the next entry. My own finish was less exciting than some but quite satisfying to me. How many more laps can I go in 31 minutes?? My smile looks more strained now! I made a math error and determined with three or four laps to go that I'd just miss reaching 82 miles. That disappointed me. Even 81.9 miles would have exceeded my goal of 75 miles by a bunch but 82 just sounded better! It wasn't until I crossed the timing mat on the 264th lap at 8:55:29 AM and walked over to the lap screen that I knew I'd run just over 82 miles, not under. Yes!!! I stopped and let a volunteer remove my timing chip. I couldn't realistically walk a 4:31 minute lap at that point and I didn't think I could run enough to finish the whole lap. Partial laps don't count. I didn't want to expend the effort to get around the loop one more time and come up a few seconds short, all for naught. I wasn't so math-challenged that I couldn't figure that one out! I happily hugged Jim and watched the rest of the runners as they finished their final lap. My race was over and I had more than exceeded my goal. I'd moved up the leader board to finish in 16th place out of 48 finishers in my race -- the top third -- and later realized I was the oldest female in any of the races this year. 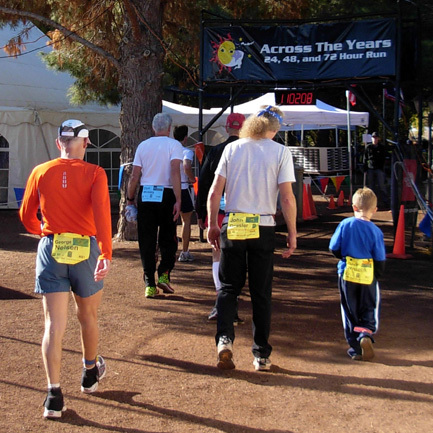 But just wait until you see the ages of the first females in the 72-, 48-, and 24-hour races at ATY this year!